The Devonshires are 100% leather in the highest grade, with beautiful, smooth, Italian leather soles. 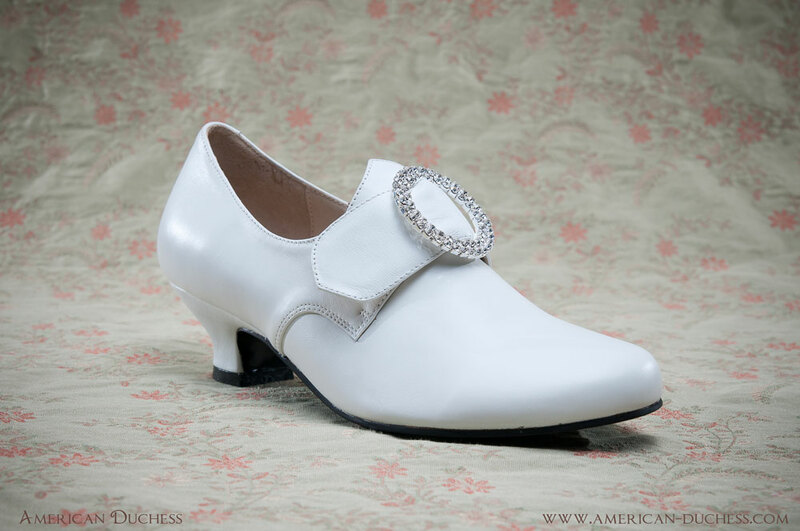 They have the same custom-made French heel as the Georgianas, and can also be dyed a variety of colors. Remember, August 1 through August 10 are the dates for the pre-order. Get the reduced price ($100! ), and size priority, even if you have to exchange them later. The goal is to collect 80 orders, so please help spread the word to your friends and costume buddies! Expected Delivery is end of September 2011. This is exciting! I do want a pair, but I still want to get my dyed silk ones first! Even if the width is off, the length should be similar, right? :D I will post this everywhere! I'm very much want to order shoes from you but I'm a bit anxious because I have "hallux vulgus" (bumps where my big toe meet the base of my foot). If I measure my foot lenght and the width of my foot over the bump, can you compare it to shoes in stock? Since I'm overseas I dont't want to risk order a too small pair. I can't order any leathers ones until the fabric ones arrive and I check the size. Hopefully they will get this side of the Pacific by 1 August. Maggie - I got the last sizes for the future orders of Devonshires and Georgianas, so I will publish that soon on the website and we will all know exactly what length and width to order! Lithia - how about sending me a PDF tracing of your foot, through e-mail? (if you have a scanner). I can fit it to one of the sizes to see what will work best. Sorry, all, I have to retract this color palette. I've not been able to find a reliable supplier to do the custom colors. Until I do, I can't offer this, sorry! :-( but I will be posting "how to" articles in the near future about how to dye and paint your shoes yourself.